Waste tire making biodiesel machine provides the most efficient biodiesel oil pyrolysis from waste tire, waste plastic and waste rubbers. The advanced designed biodiesel plant ensures high quality diesel and gasoline clear with national standard, fulfilling using for motor vehicle. This superior biodiesel technology is featured by low production cost, simple process and small environmental pollution, solving problems of process of waste rubber, tire, and plastics. ● Tire black oil ability. 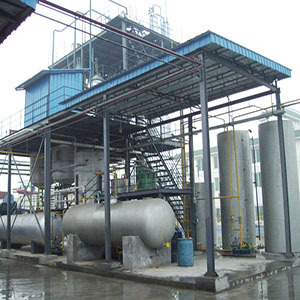 Waste tire or rubber is processed through sorting, pyrolysis crush, mix by spiral mixer in thermal cracking reactor, carbon black excluding, desulfurization or denitrification, cracking, distillation column fractionation until forming tire black oil. ● Dehydration, degumming and deacidification. Heat tire oil for degumming and dehydration, add sulfuric acid at temperature of 30-50 ° C for acidification, separate precipitation, and remove acid sludge and gum. ● Washing, neutralization and decolorization. Wash 3-5 times, add 5% reagent of sodium hydroxide caustic neutralization, separate waste lye and decolor with activated clay. ● Filtration and distillation. Filter the crude biodiesel by frame filter, catalytic distillation, add other oil and catalysts to reconcile high quality biodiesel. ● Acid sludge and gum after deacidifiction and precipitation can make waterproof membrane. 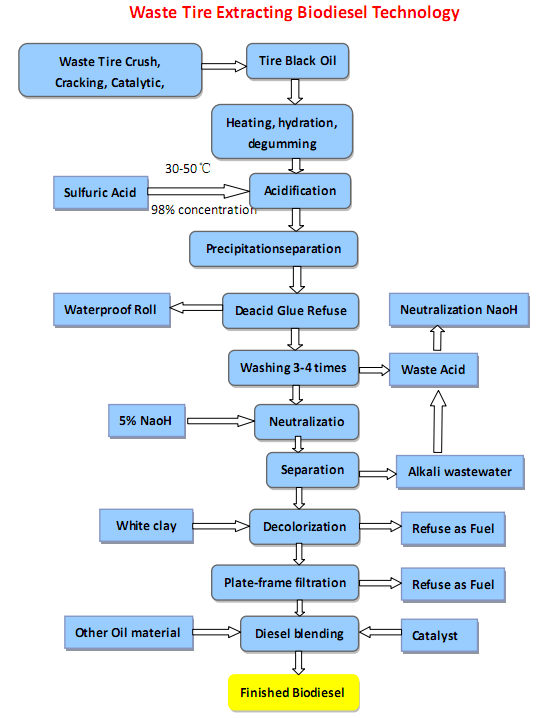 ● The neutralization of waste acid and alkali after washing can produce sodium sulfate. ● The generated waste after activated clay blenching and filtration can be used as fuel.